Jeff has started up multiple companies, but they weren’t all successful. When the dot com bubble burst, Jeff’s company was all but wiped out completely. It took real persistence for him to push past that stumbling block and reach for the next big dream. I’ve been to the SCALE Computing headquarters and feel lucky to know a handful of the team members there. There’s something magical about the culture that obviously stems from Jeff’s leadership. The standard of full transparency at SCALE keeps the team on the same page and in the know. Ready’s tell-it-like-it-is attitude sets the tone for the entire company and keeps everyone honest. “It’s like Surfing,” Ready says. Entrepreneurship is a midset and a way of living that perpetuates through every day of your life. The idea of a punch in at 8 and punch out at 6 role, is ludicrous if your goal is to build a company that is truly remarkable. It takes loads of energy and focus, and it had to be something that you love to do. 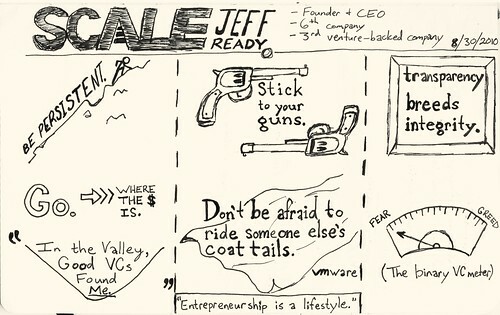 While Jeff didn’t actually say, “Ride on Someone Else’s Coat Tails,” this is largely the strategy he employed by going into the scalable server storage business with SCALE. Ready witnessed the massive success of the virtualization software goliath, VMware, and decided, “I’m going to compete with them.” By entering a market that had already been established by VMware, SCALE Computing had a benchmark for comparison and from which to position their product. I look forward to seeing SCALE Computing continue to grow as Jeff steers the ship and sells the vision. My guess is that Ready’s foundation of experience and natural leadership ability will propel the company to reach even greater success in the next six months.